Kamla Jharia‘s real name was Kamla Singh. She lived in the palace of the Maharaja of Jharia (a town in Dhanbad district, coal capital of India). Her parents probably worked in the palace in some capacity. K Mallick, who at the time was a very popular gramophone singer, was invited to the palace to sing at the court of Maharaja Shiv Prasad on the occasion of his marriage. The Maharaja was so pleased with his performance that he appointed him court singer in Jharia. It was here that K Mallick discovered Kamla’s musical talent and brought her to Calcutta and introduced her to HMV authorities. Kamla Jharia recorded four songs for HMV in 1930 and went back to Jharia. She was paid 65 Rupees for the four songs. The authorities had some problem in naming the artist. They knew her name but not her surname. They could not credit her as Miss Kamla because there was already one singer of the same name. 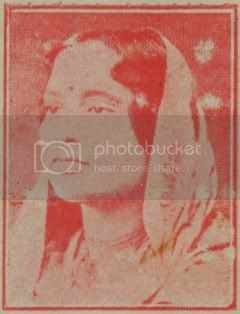 Finally it was decided to identify her as Miss Kamla Jharia keeping in mind her place of residence and thus began her illustrious musical career. Kamla became closely associated with Tulsi Lahiri, who was a film director, producer and music director, and lived with him as his wife. Kamla Jharia sang in Hindi, Bengali, Urdu, Marathi, Punjabi, Gujarati and many other Indian languages. At that time no other artist would sing in so many different languages which explains her all India status and popularity. Her singing career spanned over three decades. In 1976, The Gramophone Company of India honoured her with a Gold Disc, as a mark of lifetime achievement. In 1977, during the celebration of the golden jubilee of All India Radio, she was felicitated as one of the living legends who had taken part right from the beginning of All India Radio. Kamla Jharia suffered from chronic asthma for long and passed away on 20th December, 1979.